New Mexico’s best-kept secret is it’s stunning golf courses. With magnificent vistas surrounding all of the best courses the only question to ask is, “Should I play 18 or 36?” Whether you like mountain, desert, or links courses New Mexico has everything you need. With 300 or more days of sunshine each year and terrific golf at a fraction of the cost of other golf destinations, New Mexico should be the pick for your next golf vacation. 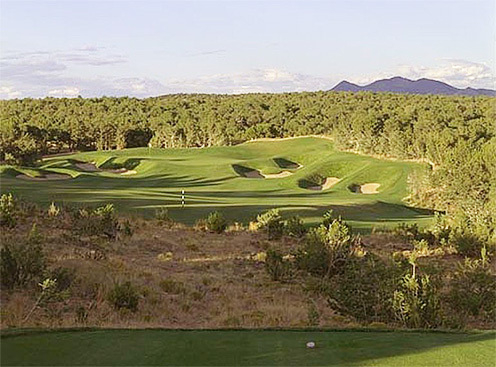 New Mexico, the Land of Enchantment offers golfers the mountains, desert and traditional parkland courses. Albuquerque: golf’s best-kept secret. Golf Digest and Golf Magazine have ranked several Albuquerque courses among the best in the country. From desert links to parkland to mountain courses, Albuquerque offers arguably the most diverse golf experience available in one area. Albuquerque’s high desert setting provides mile-high elevation, varied landscape, sunny days, low humidity and an endless blue sky for a perfect golf vacation. Unique scenery combined with affordability provides unbeatable cost-to-quality value for your golf getaway.